On both sides of the rear wheel a direct power connection transmits the (human) power to the wheel. As a result of this duality, the drive system operates under reduced strain. Gear changing is much easier, as one side has either no or lower load. The drive system also allows the spokes to be symmetrical, giving optimum wheel and overall balance. The pushing power of the leg is transferred to a pulling motion by the bicycles swinging arms. The two pairs of double strings make a pumping, alternate motion transferring the power back to the wheels, where the rear hub converts back to circular movement. The motion of the driving system is similar to the natural motion of the human legs, and in some aspects to the motion of the Locomotive. Due to Stringdrive’s elliptic driving path, in low gears (typically uphill) the pedals give a “kick-up” resulting in a slightly easier ride, as there is no true deadlock point. However when the gears are shifted higher, the riding experience will be similar to that of conventional bicycles. Stringdrive is highly efficient, as the power transmission between the pedals and the rear wheel is a pure rolling motion with the smallest possible friction loss. The ‘string’ is made of a high density polyethylene cord (HDPE). The efficiency is not affected by the actual position of the gears, thereby retaining its’ high value in all gear positions. Whilst the different bike drive systems theoretical efficiency is very high, the efficiency of the power transmission between the biker’s leg and the pedal is only at 60-70% on conventional bicycles. Stringdrive harmonizes the natural human stepping motion with the rotary motion of the drive, resulting a real symbiosis between bike and riders. For the smooth riding experience, instead of using rigid metal connections causing vibration and noise, StringDrive uses permanent transmission to achieve a no noise and gliding motion, at the same time reducing any vibration. Plasma-nitrate for the glass hard surface to avoid rust. Laser cut swinging arm from stainless spring steel. Aluminium-oxide ceramic coating on the pulley. HDPE (high density polyethylene) string. Rear drum able to withstand high-frequency movement and heavy duty springs. Rear hub parts made by CNC technology. GMN made ball bearing freewheel instead of ratcheting freewheel mechanism. Specially shaped spring provides spring loading to each axle. This spring system is used for high-frequency and precise indexing movements. In each swinging period the forward movement of the swinging arm pulls the rope forward by means of the rope wheels. The distance between the centre of rotation and the shaft changes as the shaft is traveling up and down along this traction path. The traction path has 19 neighboring recesses, and each of them corresponds to a respective gear position. Turning the single shift knob on the right handle-grip of the bike forward or backward, forcing the traveling shafts to move (in fact roll) up or down along the traction path. When the bike is rolling and not driven, the shafts on both driving units can still be moved easily up or down, thus we can change gear even if the rider is not rotating the pedals. Further more shifting gears is possible even if the pedals are under heavy load. Both driving units have their own internal symmetry. There is a pair of grooves on each rope drum, and the two rope branches leave the drum so that they are aligned perfectly with the swinging member. The two rope wheels are arranged symmetrically on the swinging member, and the rope branches that leave the rope wheels continue on their way towards a balance wheel that unites them. The balance wheel is also fully aligned, resulting in full symmetry. The driving system itself has approximately the same weight as the chain transmission, the main difference is that Stringdrive is attached to the frame and needs less maintenance. Stringdrive has a superior weight if compared to internal speed hub or lightweight gear systems, based on a gear ratio and function / weight ratio. The rear hub assembly of the Stringdrive has a symmetric design like all other parts and consists of the left and right rope drum that define the gap, where the rear wheel with the rear hub fitted. 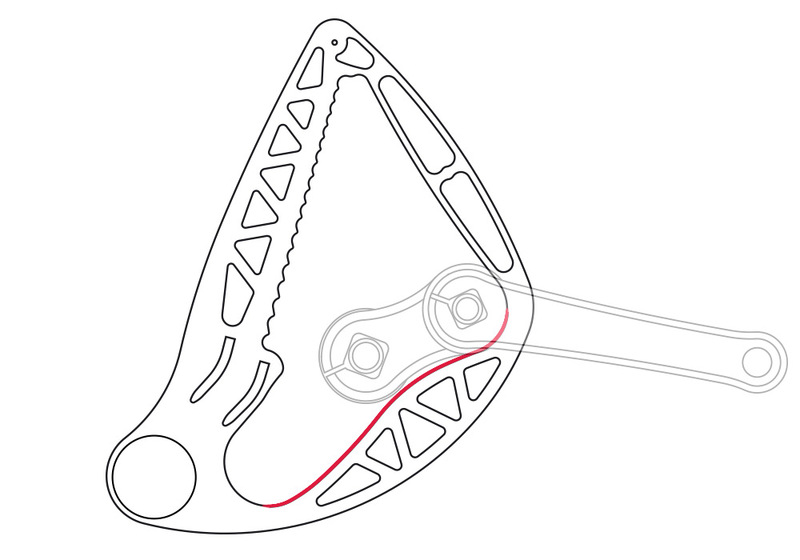 The rear hub is a closed mechanism that includes the left and right freewheel clutches, and a specially designed central locking and sensing system which unlocks the freewheel clutches at the moment when the rear wheel is turned in reverse (backward) direction to insert a third freewheel clutch, permitting the bike to roll in a backward direction. Drums come is 3 sizes: S-M-L. M is the standard size. Trading to S or L hubs changes the riding characteristics towards speed or ease of ride. 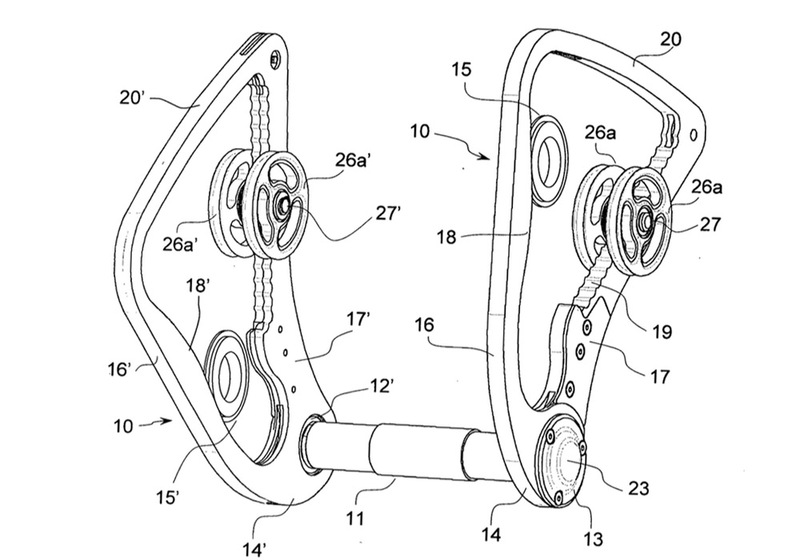 Because of the freewheel clutches in the rear hub, any forward motion of the rope will pull the bike forward. This means if we try to rotate the pedals not in a forward but in backward direction, this will also drive the bike forward. This is therefore not a fault of the system but an inherent property. Compared to maintenance requirements of conventional chains and gears, the Stringdrive requires much less care and attention, and can be stored through long periods and then used again.